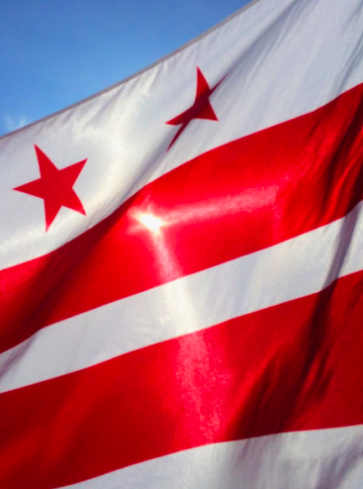 The DC flag. Photo by María Helena Carey, via Instagram. The Hilleast Taskforce is hosting a community meeting on November 19th to talk about on-going construction and deconstruction on Reservation 13. The meeting is at 7pm at St. Coletta of Greater Washington (1900 Independence Ave SE). What is the status of the facility? Are people still living in it? If so, for how long? When will it be closed? Over the past several weeks, neighbors have repeatedly express concern about the trucks entering and leaving Reservation 13. These trucks are involved in the construction of the F-1 and G-1, and they are not abiding by the transportation plan. Residents have resorted to calling MPD for assistance. There is a crime spike on Capitol Hill and MPD officers should be solving crimes instead of acting as traffic officers. What is the city’s plan to correct this problem? How many DC residents are employed as part of the construction process? Per the meeting in August, several DC residents applied to work on the construction site and they have not yet received a response. What is the status of construction on 19th Street? When will it be completed and what is the city’s plan to address the motorists who are using back alleys and other streets to avoid 19th? What is the status of DC’s Amazon bid? When is Amazon going to make its selection and what is the city’s plan for the property if Amazon does not select Reservation 13? Per press reports (https://dc.curbed.com/2018/10/29/18039134/dc-jail-redevelopment-community-engagement-criminal-justice), the city is soliciting bids for community engagement re the development of the DC Jail. What are the city’s plans for the property? Attorney General Racine opened an investigation into the sexual abuse of children by employees of the Archdiocese of Washington. Information about the investigation can be found at – https://oagdc.zendesk.com/hc/en-us/requests/new?ticket_form_id=360000330073. In addition, the Archdiocese released the names of priests who have been “credibly” accused of sexual abuse. The list can be found at – https://adw.org/about-us/policies-and-resources/accused-clergy/. I’m sharing this information because several ANC6B10 residents knew at least two of the priests on the ADW list. If you are a survivor of sexual abuse, please contact AG Racine’s office. He can assist you.